United revealed their new home kit for season 2014/15 prior to the Scottish Cup Final in April 2014, with the new gear worn for the Final against St Johnstone in May. The home top was the sixth annual Just Sports Group offering, again working in conjunction with Nike. 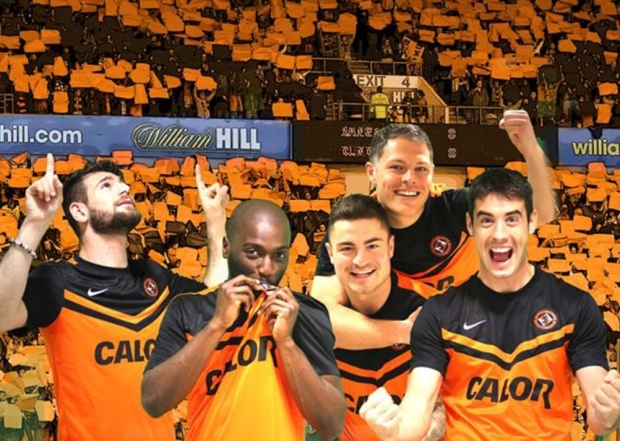 The predominantly tangerine shirt, with black chest and neck, was the first home top to feature black shoulders since the 2005 Scottish Cup and European alternative kit launched by TFG in 2005. The early launch of the shirt followed the news that Calor (main front) and GA Engineering (shoulders on back) had both extended their shirt sponsorship agreements for a further two years. Speaking at the time of the deal, Chairman Stephen Thompson said, "Calor and GA Engineering have been an integral part of what we are achieving here at Dundee United and it is great to have both of them on board at this exciting time." The Club also confirmed the signing of a new shorts sponsorship deal with local company JF Kegs in June 2014. Jimmy Fyffe, the owner of JF Kegs and a life-time United fan, agreed to sponsor the all-black shorts for two seasons. Head of Commercial Sales Paul Reid commented on the deal, "We're delighted that JF Kegs have come on board as an official kit sponsor. They are already a well established customer at the Club, with a presence on trackside and in the programme, and this deal cements the relationship even further." To complete the new kit, socks of tangerine with black tops and a secondary black hoop were sponsored by lorry hire company Norman Jamieson Ltd. It was last worn in an away defeat to Inverness in May 2015, before being replaced with the 2015/16 kit for the final League game of the season.